MILWAUKEE (AP) - - A comet named after a Wisconsin astronomer will soon streak past Earth and be the brightest comet of the year. 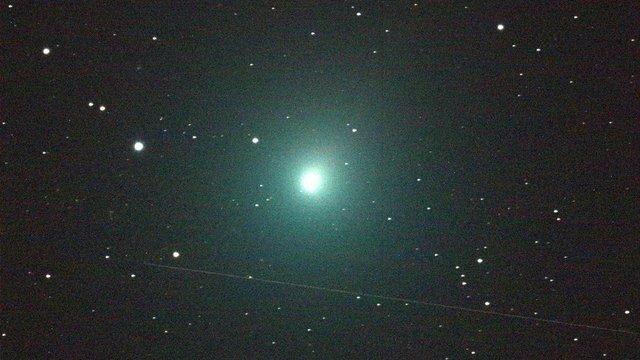 Comet 46P/Wirtanen will fly by Earth on Sunday, Dec. 16, The Milwaukee Journal Sentinel reported. It will be one of the closest comet flybys since the 1950s, but will look like a dim blur of glowing gray light. The comet is named after Carl Wirtanen, who first spotted it in 1948 while surveying the movement of faint, distant stars. Wirtanen was born in Kenosha in 1910 and became fascinated in astronomy at the age of 12. He studied astronomy, math and physics at the University of Virginia before working at the Lick Observatory in California. Comet Wirtanen orbits the sun every five-and-a-half years. The comet will be closest to the Earth on Monday, when it’ll be about 7 million miles away. The comet can be spotted by looking toward the Taurus constellation. It will sit between two bright star clusters, the Pleiades and the Hyades.